Join the conversation with our award-winning magazine. Your support enables us to lead the conversation. for subscribers in the U.S. 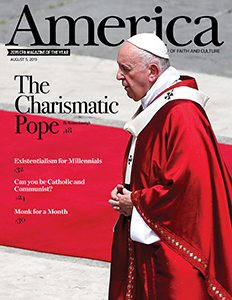 In addition to the digital edition included with a print subscription, America magazine is also available on your favorite tablet or mobile device through the services below. Subscribe for the whole year, or purchase a single issue. Prices may vary. By clicking the submit button above, you authorize America to charge your credit/debit card account at the prices above now and in time to renew your America subscription, without interruption, before the start of each new annual term at the subscriber rate then in effect unless you tell us to stop. You may cancel at any time during your subscription by contacting Customer Service and receive a full refund on all undelivered issues. We will mail you a statement prior to each subscription term with the rate and savings then in effect. If your credit/debit card account cannot be charged, we will bill you directly instead.